1. Get organized: The first step of getting out of debt is learning about the situation you are in. Begin by gathering all your credit card statements and bank statements. 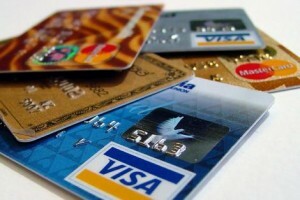 List your credit cards and their balances from the highest interest rate card to the lowest. Make goals for how much you want to put toward each card, each month. 2. Make a budget: Making a budget helps you identify how much money you are able to spend each month to pay off your debt. It also helps identify areas in which you could cut spending or increase savings. Once out of debt, a budget is a great tool to help you meet your goals without falling back on credit cards. 3. Negotiate for a lower interest rate: One by one, call the customer service center of each credit card company and ask to get a lower interest rate on your card. Often, companies will work with you and grant you a lower interest rate in hopes of retaining your business. 4. Highest interest rate first: As a general rule, it makes sense to pay the cards with the highest overall interest rate first. Since debt grows exponentially, the idea is to hit the biggest ones first to decrease the overall amount of interest you will pay back. 5. Pay more than the minimum: Always pay more than the minimum payment. If not, the interest accumulating on the balance of the loan will make it difficult for you to keep up with the repayments necessary to repay the debt in a timely manner. Eliminate any late fees by paying on time and use that money toward the balance of the loan instead. While working on your debt, consider various credit counseling programs which provide debt management education. Sometimes these are offered free of charge locally through government or church programs. If you use a debt consolidation firm, it is likely they will offer free credit counseling as well.